My Mr. A loves to draw. Thankfully he's finally learning that bodies and walls are not the places to color! At least once a day he's asking for his drawing supplies and he'll sit there color me endless pictures. 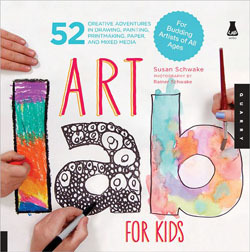 I recently had the chance to review the book "Art Lab for Kids". Let me tell you, this book was amazing! Such great projects and inspiration to do other things as well. Perhaps my favorite part of the book was the instructions at the beginning on how to get started. It states that "each person's work should be wholly his or her own. Don't work on someone else's art." I love it--mostly because W likes to be the boss and tries to "help" his brothers instead of worrying about his own work. Another idea that it suggests is to "promote fearlessness". I love that! At first I thought I would just use it with the older boys . . . but it really could be adapted to any little artist! We picked a few different projects to draw from. It was fun to work with new-to-us mediums like oil pastels. I also loved that they featured artists that also used each medium. And doing fun projects like scribble drawings. For each lab there was a list of materials needed, a "go further" section which gave you ideas of where you might go artistically based on the project, a "thinking" section to get you thinking about your art before you started and then a step-by-step outline for the lab. It really was a well-laid out book and I am looking forward to many more art projects inspired by "Art Lab For Kids." I'm going to have to check that out. We LOVE doing art at home, so this would be perfect. Sounds perfect for my two artists - thanks!